Orbital Communications Corp, Dulles, USA. Orbcomm was a commercial venture to provide global messaging services using a constellation of 26 low-Earth orbiting satellites. Communication (Data) satellite built by Orbital Sciences Corporation (OSC) for Orbcomm, USA. Launched 1995 - 1999. Used the MicroStar bus. AKA: VSUM. Status: Operational 1991. First Launch: 1991-07-17. Last Launch: 2008-06-19. Number: 26 . Gross mass: 22 kg (48 lb). Height: 0.17 m (0.55 ft). The first two satellites of the constellation experienced communications problems after launch, but were recovered and placed into operational status. The nominal 26 satellite constellation was to be deployed by 1997, with the potential for an additional 8 satellite plane and two more polar orbiters depending on demands for increased coverage. The vehicles were controlled from a single control center located in Dulles, Virginia. The cost per satellite was estimated at $1.2 million. A small forerunner vehicle, Orbcomm-X, was launched in 1991 as a feasibility demonstration. This vehicle had a different design than the operational vehicles and was not included in the operational system. ORBCOMM provided global data services (similar to 2-way paging or email) via low-Earth orbit (LEO) Satellites and ground infrastructure. Subscriber Communicators (SC) transmitted data messages to the LEO Satellite, which relayed the message to the U.S. Gateway Earth Station (GES), or International Gateway Control Centers (GCC). The GES/GCC sent the message via satellite or dedicated terrestrial line to the ORBCOMM Network Control Centre (NCC). The network was packet data only. ORBCOMM satellite coverage was available world-wide. The message delivery time (or "latency") depended on the specific hardware set-up, message size and location of the remote unit. In the continental US, ORBCOMM was committed to providing 90% in 6 minutes or less, and 98% in 15 minutes or less for all message traffic. ORBCOMM was ideal for short, daily messages and only required minimum amounts of power to operate. The ORBCOMM satellites constantly moved, so large obstructions did not prohibit communications and coverage was available in remote rural areas. In comparison, cellular telephone coverage depended on tower location, usually centered around major highways and cities, and could not reach remote areas. Geostationary satellites required large, costly and power intensive hardware. Large data files (such as graphics) or emergency response latencies would however not be appropriate applications for ORBCOMM. The spacecraft was circular, disk shaped, with circular panels hinged from each side after launch to expose solar cells. 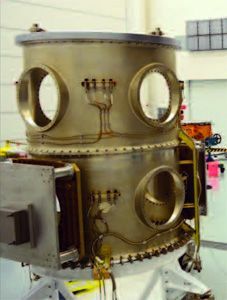 These panels articulated in 1-axis to track the sun and provided 160 W. The deployed spacecraft measured 3.6 m from end to end with a 2.3 m span across the circular disks. VHF telemetry was at 57.6 kbps. The satellite had an on-board GPS navigation and timing system, and a 14 volt power system. Gravity gradient stabilization provided 5 degrees control with magnetic torquers for damping. Cold gas (nitrogen) propulsion system. Each spacecraft carried 17 data processors and seven antennas. These were designed to handle 50,000 messages per hour. On a long boom was a 2.6 meter VHF/UHF gateway antenna. Receive: 2400 bps at 148 - 149.9 MHz. Transmit: 4800 bps at 137 - 138 MHz and 400.05 - 400.15 MHz. The system used X.400 (CCITT 1988) addressing. Message size was 6 to 250 bytes typical (no maximum). The $ 330 million program consisted of a constellation of 3 planes x 8 satellites. The first satellite was lost but put back into operation on 22 May 1995. Satellite costs were $ 135 million for 26 units. Family: Communications, Communications technology sat, Medium earth orbit, Technology. Country: USA. Spacecraft: Orbcomm, Tubsat, CDS, Microstar. Launch Vehicles: R-14, Kosmos 3, Kosmos 11K65M, Ariane, Ariane 4, Ariane 40, Pegasus, Pegasus XL, Pegasus H, Pegasus XL/HAPS, Taurus 2210. Launch Sites: Kapustin Yar, Vandenberg, Kourou, Kapustin Yar LC107/1, Kourou ELA2, Point Arguello WADZ, Mayport DZ, Wallops Island DZ. Agency: OSC, Germantown. Bibliography: 2, 279, 552, 554, 6, 6752, 12917. 1991 July 17 - . 01:46 GMT - . Launch Site: Kourou. Launch Complex: Kourou ELA2. LV Family: Ariane. Launch Vehicle: Ariane 40. Tubsat-A - . Payload: Tubsat A. Mass: 38 kg (83 lb). Nation: Germany. Agency: Orbcomm. Program: Tubsat. Class: Technology. Type: Communications technology satellite. Spacecraft: Tubsat. USAF Sat Cat: 21577 . COSPAR: 1991-050D. Apogee: 772 km (479 mi). Perigee: 762 km (473 mi). Inclination: 98.50 deg. Period: 100.20 min. Tubsat-A was the first satellite built at Germany's Technical University of Berlin was intended primarily to test attitude control subsystems and give students practice in the design, construction and operation of a satellite. 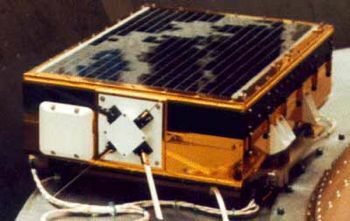 Tubsat-A was launched piggyback with the first ERS mission, and because of it's near polar orbit, the spacecraft became an important communications tool for arctic and Antarctic expeditions. The spacecraft also acted as a testbed for some industry technology including GaAs cells and a transputer. Payload: Star Sensor, Sun Sensor, 3-Axis Magnetic Field Sensor, Magnetorquer, Store & Forward Communication. Dimensions: 38x38x38 cm. Mass: 35 kg. Still in operation as of 2003. Orbcomm-X - . Payload: ERS 1 Orbcomm X. Mass: 22 kg (48 lb). Nation: USA. Agency: ESIEESPA. Class: Technology. Type: Communications technology satellite. Spacecraft Bus: MicroStar. Spacecraft: Orbcomm. USAF Sat Cat: 21576 . COSPAR: 1991-050C. Apogee: 771 km (479 mi). Perigee: 764 km (474 mi). Inclination: 98.50 deg. Period: 100.20 min. Store and forward communication..
1993 February 9 - . 14:30 GMT - . Launch Site: Cape Canaveral. Launch Complex: Mayport DZ. Launch Pad: 29.0 N x 78.3 W. Launch Platform: NB-52 008. Launch Vehicle: Pegasus. Orbcomm OXP-1 - . Payload: Orbcomm CDS. Mass: 15 kg (33 lb). Nation: USA. Agency: Orbcomm. Program: Orbcomm. Class: Communications. Type: Civilian communications satellite. Spacecraft: CDS. USAF Sat Cat: 22489 . COSPAR: 1993-009A. Apogee: 794 km (493 mi). Perigee: 731 km (454 mi). Inclination: 25.00 deg. Period: 100.10 min. Experimental spacecraft. Spacecraft engaged in research and exploration of the upper atmosphere or outer space (US Cat B). Air dropped in Mayport DZ..
1993 April 25 - . 13:56 GMT - . Launch Site: Point Arguello. Launch Complex: Point Arguello WADZ. Launch Pad: Aircraft from Edwards.. Launch Platform: NB-52 008. Launch Vehicle: Pegasus. Orbcomm OXP-2 - . Payload: VSUM. Mass: 22 kg (48 lb). Nation: USA. Agency: Orbcomm. Program: Orbcomm. Class: Communications. Type: Civilian communications satellite. Spacecraft Bus: MicroStar. Spacecraft: Orbcomm. USAF Sat Cat: 22639 . COSPAR: 1993-026B. Apogee: 843 km (524 mi). Perigee: 752 km (468 mi). Inclination: 69.92 deg. Period: 100.74 min. Air dropped in Point Arguello WADZ..
1995 April 3 - . 13:48 GMT - . Launch Site: Point Arguello. Launch Complex: Point Arguello WADZ. Launch Pad: Aircraft from Vandenberg.. Launch Platform: L-1011. LV Family: Pegasus. Launch Vehicle: Pegasus H.
Orbcomm F1 - . Payload: Orbcomm s/n FM1. Mass: 40 kg (88 lb). Nation: USA. Agency: Orbcomm. Program: Orbcomm. Class: Communications. Type: Civilian communications satellite. Spacecraft: Microstar. USAF Sat Cat: 23545 . COSPAR: 1995-017A. Apogee: 747 km (464 mi). Perigee: 728 km (452 mi). Inclination: 69.98 deg. Period: 99.56 min. Commercial communications testbed. Plane F. Ascending node 199.1 degrees. Air dropped in Point Arguello WADZ..
Orbcomm F2 - . Payload: Orbcomm s/n FM2. Mass: 40 kg (88 lb). Nation: USA. Agency: Orbcomm. Program: Orbcomm. Class: Communications. Type: Civilian communications satellite. Spacecraft: Microstar. USAF Sat Cat: 23546 . COSPAR: 1995-017B. Apogee: 747 km (464 mi). Perigee: 728 km (452 mi). Inclination: 69.98 deg. Period: 99.56 min. Commercial communications testbed. Plane F. Ascending node 198.5 degrees. Air dropped in Point Arguello WADZ..
1997 December 23 - . 19:11 GMT - . Launch Site: Wallops Island. Launch Complex: Wallops Island DZ. Launch Pad: RW04/22. Launch Platform: L-1011. LV Family: Pegasus. Launch Vehicle: Pegasus XL/HAPS. Orbcomm A1 - . Payload: Orbcomm s/n FM5. Mass: 43 kg (94 lb). Nation: USA. Agency: Orbcomm. Manufacturer: Germantown. Program: Orbcomm. Class: Communications. Type: Civilian communications satellite. Spacecraft: Microstar. USAF Sat Cat: 25112 . COSPAR: 1997-084A. Apogee: 823 km (511 mi). Perigee: 812 km (504 mi). Inclination: 45.03 deg. Period: 101.26 min. Plane A. Ascending node 297.7 degrees. Air dropped in Wallops Island DZ..
Orbcomm A8 - . Payload: Orbcomm s/n FM12. Mass: 43 kg (94 lb). Nation: USA. Agency: Orbcomm. Manufacturer: Germantown. Program: Orbcomm. Class: Communications. Type: Civilian communications satellite. Spacecraft: Microstar. USAF Sat Cat: 25119 . COSPAR: 1997-084H. Apogee: 823 km (511 mi). Perigee: 812 km (504 mi). Inclination: 45.02 deg. Period: 101.26 min. Plane A. Ascending node 301.2 degrees. Air dropped in Wallops Island DZ..
Orbcomm A2 - . Payload: Orbcomm s/n FM6. Mass: 43 kg (94 lb). Nation: USA. Agency: Orbcomm. Manufacturer: Germantown. Program: Orbcomm. Class: Communications. Type: Civilian communications satellite. Spacecraft: Microstar. USAF Sat Cat: 25113 . COSPAR: 1997-084B. Apogee: 822 km (510 mi). Perigee: 813 km (505 mi). Inclination: 45.03 deg. Period: 101.26 min. Plane A. Ascending node 300.7 degrees. Air dropped in Wallops Island DZ..
Orbcomm A5 - . Payload: Orbcomm s/n FM9. Mass: 43 kg (94 lb). Nation: USA. Agency: Orbcomm. Manufacturer: Germantown. Program: Orbcomm. Class: Communications. Type: Civilian communications satellite. Spacecraft: Microstar. USAF Sat Cat: 25116 . COSPAR: 1997-084E. Apogee: 822 km (510 mi). Perigee: 814 km (505 mi). Inclination: 45.02 deg. Period: 101.26 min. Plane A. Ascending node 301 degrees. Air dropped in Wallops Island DZ..
Orbcomm A6 - . Payload: Orbcomm s/n FM10. Mass: 43 kg (94 lb). Nation: USA. Agency: Orbcomm. Manufacturer: Germantown. Program: Orbcomm. Class: Communications. Type: Civilian communications satellite. Spacecraft: Microstar. USAF Sat Cat: 25117 . COSPAR: 1997-084F. Apogee: 823 km (511 mi). Perigee: 812 km (504 mi). Inclination: 45.02 deg. Period: 101.26 min. Plane A. Ascending node 301.2 degrees. Air dropped in Wallops Island DZ..
Orbcomm A7 - . Payload: Orbcomm s/n FM11. Mass: 43 kg (94 lb). Nation: USA. Agency: Orbcomm. Manufacturer: Germantown. Program: Orbcomm. Class: Communications. Type: Civilian communications satellite. Spacecraft: Microstar. USAF Sat Cat: 25118 . COSPAR: 1997-084G. Apogee: 823 km (511 mi). Perigee: 813 km (505 mi). Inclination: 45.02 deg. Period: 101.26 min. Plane A. Ascending node 301.2 degrees. Air dropped in Wallops Island DZ..
Orbcomm A4 - . Payload: Orbcomm s/n FM8. Mass: 43 kg (94 lb). Nation: USA. Agency: Orbcomm. Manufacturer: Germantown. Program: Orbcomm. Class: Communications. Type: Civilian communications satellite. Spacecraft: Microstar. USAF Sat Cat: 25115 . COSPAR: 1997-084D. Apogee: 823 km (511 mi). Perigee: 813 km (505 mi). Inclination: 45.02 deg. Period: 101.26 min. Plane A. Ascending node 300.5 degrees. Air dropped in Wallops Island DZ..
Orbcomm A3 - . Payload: Orbcomm s/n FM7. Mass: 43 kg (94 lb). Nation: USA. Agency: Orbcomm. Manufacturer: Germantown. Program: Orbcomm. Class: Communications. Type: Civilian communications satellite. Spacecraft: Microstar. USAF Sat Cat: 25114 . COSPAR: 1997-084C. Apogee: 822 km (510 mi). Perigee: 813 km (505 mi). Inclination: 45.03 deg. Period: 101.26 min. Plane A. Ascending node 301 degrees. Air dropped in Wallops Island DZ..
1998 February 10 - . 13:20 GMT - . Launch Site: Vandenberg. Launch Complex: Vandenberg 576E. LV Family: Taurus. Launch Vehicle: Taurus 2210. Orbcomm G1 - . Payload: Orbcomm s/n FM3. Mass: 43 kg (94 lb). Nation: USA. Agency: Orbcomm. Manufacturer: Germantown. Program: Orbcomm. Class: Communications. Type: Civilian communications satellite. Spacecraft: Microstar. USAF Sat Cat: 25158 . COSPAR: 1998-007B. Apogee: 874 km (543 mi). Perigee: 781 km (485 mi). Inclination: 107.99 deg. Period: 101.46 min. Plane G. Ascending node 297.9 degrees..
Orbcomm G2 - . Payload: Orbcomm s/n FM4. Mass: 43 kg (94 lb). Nation: USA. Agency: Orbcomm. Manufacturer: Germantown. Program: Orbcomm. Class: Communications. Type: Civilian communications satellite. Spacecraft: Microstar. USAF Sat Cat: 25159 . COSPAR: 1998-007C. Apogee: 871 km (541 mi). Perigee: 783 km (486 mi). Inclination: 107.99 deg. Period: 101.45 min. Plane G. Ascending node 298.1 degrees..
1998 August 2 - . 16:24 GMT - . Launch Site: Wallops Island. Launch Complex: Wallops Island DZ. Launch Pad: RW04/22. Launch Platform: L-1011. LV Family: Pegasus. Launch Vehicle: Pegasus XL/HAPS. Orbcomm B5 - . Payload: Orbcomm s/n FM17. Mass: 22 kg (48 lb). Nation: USA. Agency: Orbcomm. Manufacturer: Germantown. Program: Orbcomm. Class: Communications. Type: Civilian communications satellite. Spacecraft Bus: MicroStar. Spacecraft: Orbcomm. USAF Sat Cat: 25413 . COSPAR: 1998-046A. Apogee: 824 km (512 mi). Perigee: 813 km (505 mi). Inclination: 45.00 deg. Period: 101.28 min. Plane B. Ascending node 61 degrees. Air dropped in Wallops Island DZ..
Orbcomm B6 - . Payload: Orbcomm s/n FM18. Mass: 22 kg (48 lb). Nation: USA. Agency: Orbcomm. Manufacturer: Germantown. Program: Orbcomm. Class: Communications. Type: Civilian communications satellite. Spacecraft Bus: MicroStar. Spacecraft: Orbcomm. USAF Sat Cat: 25414 . COSPAR: 1998-046B. Apogee: 827 km (513 mi). Perigee: 810 km (500 mi). Inclination: 45.00 deg. Period: 101.28 min. Plane B. Ascending node 59.7 degrees. Air dropped in Wallops Island DZ..
Orbcomm B1 - . Payload: Orbcomm s/n FM13. Mass: 22 kg (48 lb). Nation: USA. Agency: Orbcomm. Manufacturer: Germantown. Program: Orbcomm. Class: Communications. Type: Civilian communications satellite. Spacecraft Bus: MicroStar. Spacecraft: Orbcomm. USAF Sat Cat: 25420 . COSPAR: 1998-046H. Apogee: 824 km (512 mi). Perigee: 813 km (505 mi). Inclination: 45.00 deg. Period: 101.27 min. Plane B. Ascending node 60.4 degrees. Air dropped in Wallops Island DZ..
Orbcomm B2 - . Payload: Orbcomm s/n FM14. Mass: 22 kg (48 lb). Nation: USA. Agency: Orbcomm. Manufacturer: Germantown. Program: Orbcomm. Class: Communications. Type: Civilian communications satellite. Spacecraft Bus: MicroStar. Spacecraft: Orbcomm. USAF Sat Cat: 25419 . COSPAR: 1998-046G. Apogee: 826 km (513 mi). Perigee: 811 km (503 mi). Inclination: 45.00 deg. Period: 101.28 min. Plane B. Ascending node 60.4 degrees. Air dropped in Wallops Island DZ..
Orbcomm B3 - . Payload: Orbcomm s/n FM15. Mass: 22 kg (48 lb). Nation: USA. Agency: Orbcomm. Manufacturer: Germantown. Program: Orbcomm. Class: Communications. Type: Civilian communications satellite. Spacecraft Bus: MicroStar. Spacecraft: Orbcomm. USAF Sat Cat: 25418 . COSPAR: 1998-046F. Apogee: 825 km (512 mi). Perigee: 812 km (504 mi). Inclination: 45.01 deg. Period: 101.28 min. Plane B. Ascending node 60 degrees. Air dropped in Wallops Island DZ..
Orbcomm B4 - . Payload: Orbcomm s/n FM16. Mass: 22 kg (48 lb). Nation: USA. Agency: Orbcomm. Manufacturer: Germantown. Program: Orbcomm. Class: Communications. Type: Civilian communications satellite. Spacecraft Bus: MicroStar. Spacecraft: Orbcomm. USAF Sat Cat: 25417 . COSPAR: 1998-046E. Apogee: 825 km (512 mi). Perigee: 812 km (504 mi). Inclination: 45.00 deg. Period: 101.28 min. Plane B. Ascending node 59.9 degrees. Air dropped in Wallops Island DZ..
Orbcomm B7 - . Payload: Orbcomm s/n FM19. Mass: 22 kg (48 lb). Nation: USA. Agency: Orbcomm. Manufacturer: Germantown. Program: Orbcomm. Class: Communications. Type: Civilian communications satellite. Spacecraft Bus: MicroStar. Spacecraft: Orbcomm. USAF Sat Cat: 25415 . COSPAR: 1998-046C. Apogee: 828 km (514 mi). Perigee: 809 km (502 mi). Inclination: 45.00 deg. Period: 101.28 min. Plane B. Ascending node 61.1 degrees. Air dropped in Wallops Island DZ..
Orbcomm B8 - . Payload: Orbcomm s/n FM20. Mass: 22 kg (48 lb). Nation: USA. Agency: Orbcomm. Manufacturer: Germantown. Program: Orbcomm. Class: Communications. Type: Civilian communications satellite. Spacecraft Bus: MicroStar. Spacecraft: Orbcomm. USAF Sat Cat: 25416 . COSPAR: 1998-046D. Apogee: 826 km (513 mi). Perigee: 811 km (503 mi). Inclination: 45.00 deg. Period: 101.28 min. Plane B. Ascending node 61.2 degrees. Air dropped in Wallops Island DZ..
1998 September 23 - . 05:06 GMT - . Launch Site: Wallops Island. Launch Complex: Wallops Island DZ. Launch Pad: RW04/22. Launch Platform: L-1011. LV Family: Pegasus. Launch Vehicle: Pegasus XL/HAPS. 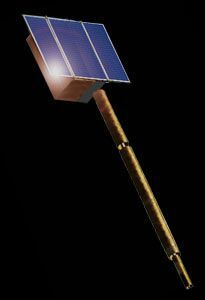 Orbcomm C1 - . Payload: Orbcomm s/n FM21. Mass: 22 kg (48 lb). Nation: USA. Agency: Orbcomm. Manufacturer: Germantown. Program: Orbcomm. Class: Communications. Type: Civilian communications satellite. Spacecraft Bus: MicroStar. Spacecraft: Orbcomm. USAF Sat Cat: 25475 . COSPAR: 1998-053A. Apogee: 825 km (512 mi). Perigee: 811 km (503 mi). Inclination: 45.01 deg. Period: 101.27 min. Plane C. Ascending node 181.6 degrees. Air dropped in Wallops Island DZ..
Orbcomm C4 - . Payload: Orbcomm s/n FM24. Mass: 22 kg (48 lb). Nation: USA. Agency: Orbcomm. Manufacturer: Germantown. Program: Orbcomm. Class: Communications. Type: Civilian communications satellite. Spacecraft Bus: MicroStar. Spacecraft: Orbcomm. USAF Sat Cat: 25478 . COSPAR: 1998-053D. Apogee: 822 km (510 mi). Perigee: 814 km (505 mi). Inclination: 45.01 deg. Period: 101.27 min. Plane C. Ascending node 181.7 degrees. Air dropped in Wallops Island DZ..
Orbcomm C3 - . Payload: Orbcomm s/n FM23. Mass: 22 kg (48 lb). Nation: USA. Agency: Orbcomm. Manufacturer: Germantown. Program: Orbcomm. Class: Communications. Type: Civilian communications satellite. Spacecraft Bus: MicroStar. Spacecraft: Orbcomm. USAF Sat Cat: 25477 . COSPAR: 1998-053C. Apogee: 823 km (511 mi). Perigee: 813 km (505 mi). Inclination: 45.02 deg. Period: 101.27 min. Plane C. Ascending node 181.8 degrees. Air dropped in Wallops Island DZ..
Orbcomm C2 - . Payload: Orbcomm s/n FM22. Mass: 22 kg (48 lb). Nation: USA. Agency: Orbcomm. Manufacturer: Germantown. Program: Orbcomm. Class: Communications. Type: Civilian communications satellite. Spacecraft Bus: MicroStar. Spacecraft: Orbcomm. USAF Sat Cat: 25476 . COSPAR: 1998-053B. Apogee: 823 km (511 mi). Perigee: 814 km (505 mi). Inclination: 45.02 deg. Period: 101.27 min. Plane C. Ascending node 178 degrees. Air dropped in Wallops Island DZ..
Orbcomm C6 - . Payload: Orbcomm s/n FM26. Mass: 22 kg (48 lb). Nation: USA. Agency: Orbcomm. Manufacturer: Germantown. Program: Orbcomm. Class: Communications. Type: Civilian communications satellite. Spacecraft Bus: MicroStar. Spacecraft: Orbcomm. USAF Sat Cat: 25480 . COSPAR: 1998-053F. Apogee: 825 km (512 mi). Perigee: 811 km (503 mi). Inclination: 45.01 deg. Period: 101.27 min. Plane C. Ascending node 181.5 degrees. Air dropped in Wallops Island DZ..
Orbcomm C7 - . Payload: Orbcomm s/n FM27. Mass: 22 kg (48 lb). Nation: USA. Agency: Orbcomm. Manufacturer: Germantown. Program: Orbcomm. Class: Communications. Type: Civilian communications satellite. Spacecraft Bus: MicroStar. Spacecraft: Orbcomm. USAF Sat Cat: 25481 . COSPAR: 1998-053G. Apogee: 823 km (511 mi). Perigee: 813 km (505 mi). Inclination: 45.02 deg. Period: 101.27 min. Plane C. Ascending node 181.6 degrees. Air dropped in Wallops Island DZ..
Orbcomm C8 - . Payload: Orbcomm s/n FM28. Mass: 22 kg (48 lb). Nation: USA. Agency: Orbcomm. Manufacturer: Germantown. Program: Orbcomm. Class: Communications. Type: Civilian communications satellite. Spacecraft Bus: MicroStar. Spacecraft: Orbcomm. USAF Sat Cat: 25482 . COSPAR: 1998-053H. Apogee: 824 km (512 mi). Perigee: 813 km (505 mi). Inclination: 45.03 deg. Period: 101.27 min. Plane C. Ascending node 181.7 degrees. Air dropped in Wallops Island DZ..
Orbcomm C5 - . Payload: Orbcomm s/n FM25. Mass: 22 kg (48 lb). Nation: USA. Agency: Orbcomm. Manufacturer: Germantown. Program: Orbcomm. Class: Communications. Type: Civilian communications satellite. Spacecraft Bus: MicroStar. Spacecraft: Orbcomm. USAF Sat Cat: 25479 . COSPAR: 1998-053E. Apogee: 824 km (512 mi). Perigee: 813 km (505 mi). Inclination: 45.01 deg. Period: 101.27 min. Plane C. Ascending node 181.5 degrees. Air dropped in Wallops Island DZ..
1999 December 4 - . 18:53 GMT - . Launch Site: Wallops Island. Launch Complex: Wallops Island DZ. Launch Pad: RW04/22. Launch Platform: L-1011. LV Family: Pegasus. Launch Vehicle: Pegasus XL/HAPS. Orbcomm FM30 - . Mass: 45 kg (99 lb). Nation: USA. Agency: Orbcomm. Manufacturer: Germantown. Program: Orbcomm. Class: Communications. Type: Civilian communications satellite. Spacecraft Bus: MicroStar. Spacecraft: Orbcomm. USAF Sat Cat: 25980 . COSPAR: 1999-065A. Apogee: 798 km (495 mi). Perigee: 790 km (490 mi). Inclination: 45.00 deg. Period: 100.70 min. Seven Orbcomms launched, rather than eight as on previous flights. Air dropped in Wallops Island DZ..
Orbcomm FM32 - . Mass: 45 kg (99 lb). Nation: USA. Agency: Orbcomm. Manufacturer: Germantown. Program: Orbcomm. Class: Communications. Type: Civilian communications satellite. Spacecraft Bus: MicroStar. Spacecraft: Orbcomm. USAF Sat Cat: 25982 . COSPAR: 1999-065C. Apogee: 798 km (495 mi). Perigee: 788 km (489 mi). Inclination: 45.00 deg. Period: 100.70 min. Air dropped in Wallops Island DZ..
Orbcomm FM31 - . Mass: 45 kg (99 lb). Nation: USA. Agency: Orbcomm. Manufacturer: Germantown. Program: Orbcomm. Class: Communications. Type: Civilian communications satellite. Spacecraft Bus: MicroStar. Spacecraft: Orbcomm. USAF Sat Cat: 25981 . COSPAR: 1999-065B. Apogee: 798 km (495 mi). Perigee: 790 km (490 mi). Inclination: 45.00 deg. Period: 100.70 min. Air dropped in Wallops Island DZ..
Orbcomm FM33 - . Mass: 45 kg (99 lb). Nation: USA. Agency: Orbcomm. Manufacturer: Germantown. Program: Orbcomm. Class: Communications. Type: Civilian communications satellite. Spacecraft Bus: MicroStar. Spacecraft: Orbcomm. USAF Sat Cat: 25983 . COSPAR: 1999-065D. Apogee: 793 km (492 mi). Perigee: 780 km (480 mi). Inclination: 45.00 deg. Period: 100.60 min. Air dropped in Wallops Island DZ..
Orbcomm FM36 - . Mass: 45 kg (99 lb). Nation: USA. Agency: Orbcomm. Manufacturer: Germantown. Program: Orbcomm. Class: Communications. Type: Civilian communications satellite. Spacecraft Bus: MicroStar. Spacecraft: Orbcomm. USAF Sat Cat: 25986 . COSPAR: 1999-065G. Apogee: 797 km (495 mi). Perigee: 790 km (490 mi). Inclination: 45.00 deg. Period: 100.70 min. Air dropped in Wallops Island DZ..
Orbcomm FM35 - . Mass: 45 kg (99 lb). Nation: USA. Agency: Orbcomm. Manufacturer: Germantown. Program: Orbcomm. Class: Communications. Type: Civilian communications satellite. Spacecraft Bus: MicroStar. Spacecraft: Orbcomm. USAF Sat Cat: 25985 . COSPAR: 1999-065F. Apogee: 797 km (495 mi). Perigee: 791 km (491 mi). Inclination: 45.00 deg. Period: 100.70 min. Air dropped in Wallops Island DZ..
Orbcomm FM34 - . Mass: 45 kg (99 lb). Nation: USA. Agency: Orbcomm. Manufacturer: Germantown. Program: Orbcomm. Class: Communications. Type: Civilian communications satellite. Spacecraft Bus: MicroStar. Spacecraft: Orbcomm. USAF Sat Cat: 25984 . COSPAR: 1999-065E. Apogee: 795 km (493 mi). Perigee: 792 km (492 mi). Inclination: 45.00 deg. Period: 100.70 min. Air dropped in Wallops Island DZ..
2008 June 19 - . 06:36 GMT - . Launch Site: Kapustin Yar. Launch Complex: Kapustin Yar LC107/1. LV Family: R-14. Launch Vehicle: Kosmos 11K65M. Orbcomm FM 38 - . Mass: 115 kg (253 lb). Nation: USA. Agency: Orbcomm. Program: Orbcomm. Class: Communications. Type: Civilian communications satellite. Spacecraft: Sterkh. USAF Sat Cat: 33060 . COSPAR: 2008-031A. Apogee: 672 km (417 mi). Perigee: 660 km (410 mi). Inclination: 48.50 deg. Period: 98.10 min. Orbcomm FM 41 - . Mass: 115 kg (253 lb). Nation: USA. Agency: Orbcomm. Program: Orbcomm. Class: Communications. Type: Civilian communications satellite. Spacecraft: Sterkh. USAF Sat Cat: 33061 . COSPAR: 2008-031B. Apogee: 672 km (417 mi). Perigee: 661 km (410 mi). Inclination: 48.40 deg. Period: 98.10 min. Orbcomm FM 29 - . Mass: 115 kg (253 lb). Nation: USA. Agency: Orbcomm. Program: Orbcomm. Class: Communications. Type: Civilian communications satellite. Spacecraft Bus: MicroStar. Spacecraft: Orbcomm. USAF Sat Cat: 33062 . COSPAR: 2008-031C. Apogee: 672 km (417 mi). Perigee: 661 km (410 mi). Inclination: 48.40 deg. Period: 98.10 min. Orbcomm FM 39 - . Mass: 115 kg (253 lb). Nation: USA. Agency: Orbcomm. Program: Orbcomm. Class: Communications. Type: Civilian communications satellite. Spacecraft: Sterkh. USAF Sat Cat: 33063 . COSPAR: 2008-031D. Apogee: 672 km (417 mi). Perigee: 661 km (410 mi). Inclination: 48.40 deg. Period: 98.10 min. Orbcomm FM 37 - . Mass: 115 kg (253 lb). Nation: USA. Agency: Orbcomm. Program: Orbcomm. Class: Communications. Type: Civilian communications satellite. Spacecraft: Sterkh. USAF Sat Cat: 33064 . COSPAR: 2008-031E. Apogee: 672 km (417 mi). Perigee: 661 km (410 mi). Inclination: 48.50 deg. Period: 98.10 min. 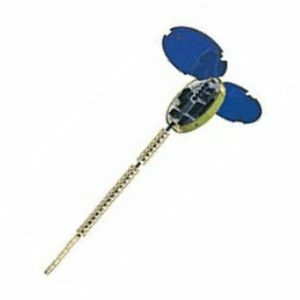 Orbcomm FM 40 - . Mass: 115 kg (253 lb). Nation: USA. Agency: Orbcomm. Program: Orbcomm. Class: Communications. Type: Civilian communications satellite. Spacecraft: Sterkh. USAF Sat Cat: 33065 . COSPAR: 2008-031F. Apogee: 672 km (417 mi). Perigee: 661 km (410 mi). Inclination: 48.50 deg. Period: 98.10 min.